Hank Bounds (left), president of the University of Nebraska system, congratulates Chancellor Ronnie Green after officially installing Green as Nebraska's 20th chancellor. Gov. Pete Ricketts applauds in the background. Given Ronnie Green’s background in genetics, it was perhaps no surprise that, moments after being officially installed April 6 as the university’s chancellor, he extended a useful metaphor to the institution he leads. DNA, Green told a full house at the Lied Center for Performing Arts, is a common language of life. It contains thousands of interrelated genes, which create the world’s building blocks. It is heavily influenced by external factors, and must keep evolving and adapting to change. And it can be replicated, added to and passed down from generation to generation. It’s easy to see how those parallels fit the state’s flagship university, the chancellor said. 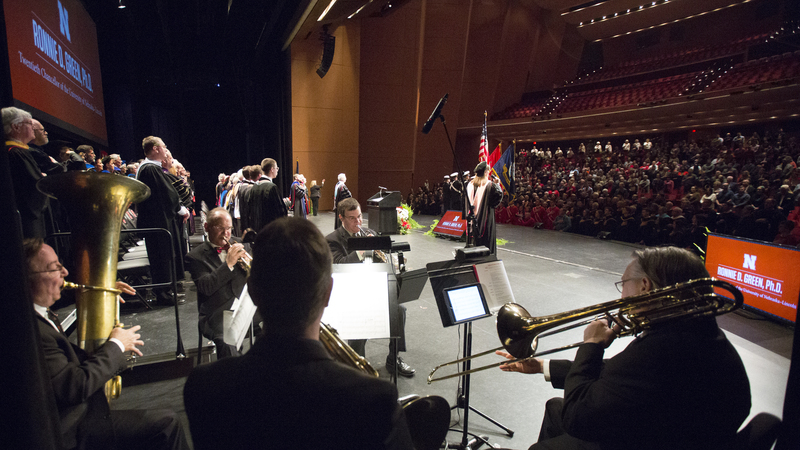 Jamie Reimer sings while the University of Nebraska Brass Quintet plays the National Anthem at the start of the installation ceremony for Chancellor Ronnie Green. The event was April 6 at the Lied Center for Performing Arts. Green, 55, was named the university’s leader exactly one year ago. He was officially installed April 6 as Nebraska’s 20th chancellor in a late-morning ceremony highlighted by a grand processional, faculty garbed in academic regalia and the investiture of the official powers and responsibilities of the position by NU system President Hank Bounds and Regents Chairman Bob Whitehouse. Dignitaries from across the university, higher education and the United States, as well as international partners and leaders in private industry, business and government took part in the ceremony. The event also included a keynote speech from the late Clayton Yeutter, which was recorded before his March 4 death. Green counts Yeutter, a former U.S. secretary of agriculture, as a mentor and major influence on his life and career. The installation is a celebratory tradition that officially marks the start of a new chancellorship at Nebraska. Typically held during the chancellor’s first year in office, the event provides an opportunity to welcome a new chapter in the institution’s history and to celebrate as a community. Amid that sense of history, Green reflected upon past generations, back to the 19th century and their profound role in making Nebraska what it is today. The chancellor invoked moments and decisions throughout the institution’s 15 decades in which he said leaders advanced the university’s role in the state and world: James Canfield in the early 1900s, faced with rapidly changing societal norms and needs in the industrial revolution; Samuel Avery during World War I and a deeply divided nation; Edgar Burnett during the Great Depression; Clifford Hardin during the post-war baby boom, when both the number of students and the university’s obligation to deliver on its mission doubled; Martin Massengale during the energy and farm crises of the 1980s; and his predecessor, Harvey Perlman, in the tumultuous turn of the 21st century. Armed with this perspective, Green said, it is humbling to understand that choices made today will affect not just current Nebraskans, but potentially generations to come. In October, Green announced a timeline that could make a newly formed strategic plan a reality by 2018. He also outlined four task forces that will provide background information to develop key areas of the plan. Those task forces include the areas of achieving distinction, budget modeling, smart enrollment growth and student matriculation success. He has also set growth goals in both enrollment and research expenditures by 2025. Optimism and fearlessness abound at Nebraska, he said – a spirit that breaks through conventions and that is part of that DNA that transfers to everyone in the university community and beyond.